Every time I make meatloaf I have to think of my friend AnnMarie. A sophisticated American-Italian from New York, she told me that her mum would serve meatloaf only to family. Apparently she did not consider it presentable to guests due to its lack of elegance. The remark caused a certain level of worry as the dish had been ruthlessly celebrated in my house – and with pride – as one of the best inventions to be placed on a dinner table. This was a long time ago, more than 20 years. Meanwhile something must have happened as the meatloaf has been voted in 2007 the seventh-favorite dish in the US. Someone must have decided to stop keeping it to themselves. 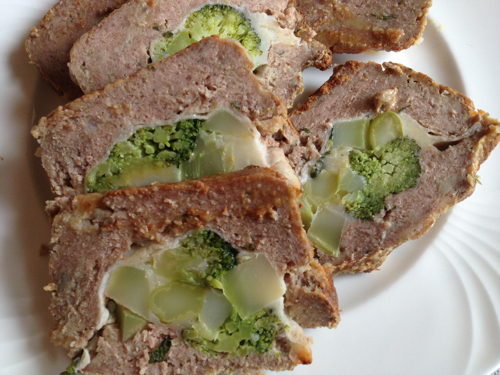 This is our official family meatloaf, stuffed with fragrant broccoli which are in season now. You can of course use other veggies like asparagus or green beans. It’s actually a fabulous dish for entertaining as you can prepare and cook it a day ahead. Slice it one hour before serving and pop it in the microwave for a few minutes just to soften it. Don’t over-warm it though. It will fall apart and lose its good looks. Blanch broccoli in plenty boiling water for 5 min. Drain and sauté in 1 tablespoon olive oil and garlic for 1 min or until just fragrant. Season lightly. Preheat oven at 200 °C (390 °F). Combine meat, egg, milk, black pepper and salt with bread crumbs. Mix with your hands until the mixture is cohesive. Butter generously a 1.2 lt (5 cups) terrine or loaf mold. Reserve about 1/4 of the meat and use the rest to fill the bottom and sides of the mould, making a 1 cm (1/2 inch) thick compact layer. Line the ground-meat case with slices of guanciale (or pancetta) overlapping edges slightly and leaving a 2 cm (1 inch) overhang on the sides. Note: in a classic French terrine the fat is used to line the mould. In this recipe the fat is used inside the meat case to give flavor to the filling. Now fill all the rest of the space with broccoli and diced cheese. Press down the filling to avoid gaps. Cover the filling with the overhanging pancetta followed by the rest of the ground-meat. Brush the top layer of meat with a small amount of melted butter and bake uncovered for 40 min or until starting to become golden around the sides. Cool off completely. Slice and serve as explained above. PS. Please don’t ask me a sauce. If you must have tomatoes, serve the meatloaf with a mound of cherry tomatoes dressed in fruity olive oil piled over toasted crusty bread. Or over mashed potatoes. I promise you, it’s enough for a glorious meal. Next Post Colomba: a traditional Italian Easter bread shaped like a dove. STUNNING – absolutely gorgeous – delicious, nutritious and economical! You are singing my song. No easy task to get it to present to perfectly, either! Bravo, Letizia! Cannot wait to try it! Valerie, thank you for being ever so kind! Indeed it’s looks great and it’a family recipe through and through. However it’s not difficult to make it looking good as long as one is patien and slices it when is at room temperature. Way easier than a French terrine! 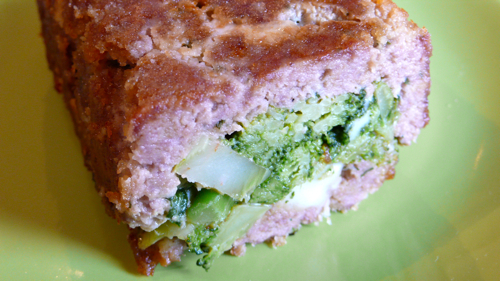 What a fabulous idea to incorporate the veggies within the meatloaf itself! It is a winter favorite and staple in my household; always love to hear new variations. PS for those who truly insist on the addition of tomato for flavor, I have recently played with adding tomato paste and red wine to the meatloaf itself, saving some to spread over the top. Very tasty!!! I particularly like the red wine addition Sarah! This looks and sounds wonderful. It’s been too long since I’ve made meatloaf and this sounds like a plan! ciao Frank, buona Pasqua, I am sure you will cook some magnificent dishes! I made this last weekend and it lasted the entire week. And was more and more delicious every day. Definitely adding this to the permanent rotation. ciao Rebecca, thank you for your comment about the meatloaf, I am happy to know you liked it! You can also make seasonal variations using different vegetables. Asparagus or artichokes are always a success here in our home.